Follow these steps to link from one area of a page to another. 1. 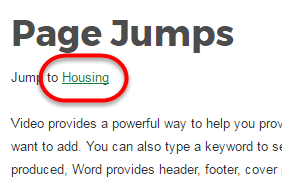 Place your cursor within the page to the location where the link will 'jump'. 2. Place an anchor tag. 3. Be consistent in naming your anchors; typically don't capitalize and don't use spaces. 4. The anchor will appear as a red flag in the document. 5. 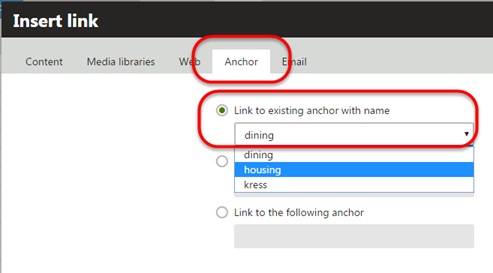 Create the hyperlink that will jump to the anchor: Highlight the text that will be hyperlinked; click on the "Link" icon. 6. 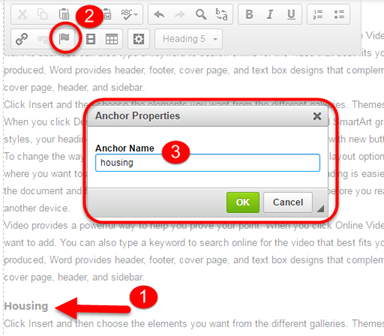 Select the anchor tab and click on first radio button; select the proper anchor from the drop-down list. Save and Close. 7. Save the document and test the link using the preview. NOTE: If you are using a Widget to create the hyperlinks, you won't have the ability to pick the anchor from the drop-down list. Select the "Anchor" tab. Your only choice is "Link to the following anchor..." Manually type in the anchor name that you created.